The religious right, including the president and his brother in Florida, believe that gay adoptions are a threat to the sanctity of good Christian American families. I think these nice church-going people are doing enough damage without any help from us homos. These people were getting money from their church, which they drove 30 miles each way to attend to help pay their rent. The Jackson family. Bruce, middle row, second from right; Keith, bottom left; Michael, bottom center; Tyronne, behind Keith. 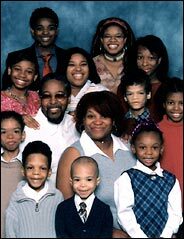 The Jacksons are in jail in Camden County, charged with starving and neglecting the 4-foot, 19-year-old Bruce and three other boys adopted from the New Jersey foster care system � Michael, 9, Tyronne, 10, and Keith, 14 � so seriously that none of them weighed more than 50 pounds when they were found by the police. Still, though the children were homeschooled, they were not hidden away. The parents drove the 30 miles from their home here to the Come Alive New Testament Church in Medford every Sunday. "I have told many people that I have never seen that many kids together be so good. I never saw them fighting, and I never saw them arguing, and I said, 'Wow, every family should be like that.' "
Mr. Cotton said that it did not appear that Bruce Jackson had any friends. "I asked him whether he went to church or not. He said that he was not allowed to go because he was bad � because he liked TV earlier in life, one of his big punishments was that he was made to sit in front of the TV for hours with it off. Stuff that doesn't make sense." "I think these kids were convinced by the foster parents that they had eating disorders," he said. Mr. Cotton continued, "These are bright kids, they read well, they're smart, they're polite, and I think they're realizing what happened was not anywhere near the norm." Bruce, the one mentioned at the end of the article, is 19. UPDATED: Here is a good article on the GOP's plans to use gay marriage as a major issue in the 2004 elections. I have heard of these parents before, but not before reading this did I realize how screwed up this whole thing is. Now the parents are going to (hopefully) be in jail a long time, but now what happens to the kids? This is what people don't think about. My parents adopted my brother at birth, he is bi-racial. This caused quite a stir, especially with the local government. Valparaiso, IN is a very racist community and the Department of Family Services is an extension of that environment. Again it goes back to the fact that these people are just there for a job, they don't give a care about the children. It shouldn't matter what sexual orientation you are, or what race you are, or how tall you are. This is all wholly ill relevant. The question is can you provide a good home with parents that love and care for you? Yes, Blaine. NJ is one of the richest states in the country, but most of its citizens seem to think it's more important to keep taxes as low as possible rather than spend the dollars it takes to keep kids safe. We have terrible priorities in this country. "I think these nice church-going people are doing enough damage without any help from us homos." Aren't you just stereotyping these people? I'm no longer religious but I'm thoroughly sick and tired of the fact that as long as it is known that you are a Christian, you are immediately branded a Right Wing Fundamentalist, a bigot and hypocrite, and are relentlessly lampooned on the net and most everywhere else. Basically as long as you stick to some form of organised religion which isn't exotic or eastern, you're a hopeless imbecile. I've known many Chistians, flawed but basically good people, just like the rest of us. It's not okay to sterotype/discriminate against blacks, gays etc but it's okay to stereotype Christians because they've committed atrocities in the name of religion before. Well it doesn't matter who or what you're discriminating against, as long as you discriminate it's still wrong. If we want people to accept us, it has to work both ways. Ian, your post doesn't really make sense. I attacked that one family, the church who supported them, and the Religious Right. If those groups are the sole representatives of their religion, then damn right they deserve to be attacked as ignorant bigots. I think Christians are allowing their religion to be hijacked by the right wing, and if they care anything about it they should be fighting it. Otherwise, they are collaborators, allowing people to use "their God" to attack other people while remaining silent. I was in the system for 21 years. I have never seen anything like this. Those kids should have no been treated like that. Christian, Catholic, Baptist... it dont matter what religion they were, people should not treat other people like that. This is a rude awakening. I hope they are suffering just as much as they made those kids suffer. I know two wrongs dont make a right but in this case.. i think it goes perfectly. Published on October 28, 2003 1:05 PM. previous entry: Lea DeLaria in Beckett?